Informed Consent is a Human Right: The right to voluntary, informed consent to a medical intervention, including use of a pharmaceutical product such as a vaccine that can injure or kill you or your child, is a human right. Vaccine Laws Have Exemptions: In 1905, the U.S. Supreme Court affirmed the legal authority of state governments to pass laws requiring citizens residing in the state to use certain vaccines. Today, all 50 states have enacted vaccine laws that require proof of vaccination for children to attend daycare, elementary, junior and high school and college. Vaccine requirements vary from state to state and all 50 states allow a medical exemption to vaccination; 48 states allow a religious exemption to vaccination; and 18 states allow a personal, philosophical or conscientious belief exemption to vaccination. To find out what your state vaccine law says and which exemptions you may take and how to take them, click here. Freedom is Not Free, Become a Vaccine Choice Advocate: Many state governments now require nearly three dozen doses of more than a dozen vaccines to attend school. Medical and religious exemptions are becoming harder to get and exemptions for reasons of conscience are under attack by proponents of forced vaccination. The National Vaccine Information Center is working with citizens in states to expand or protect legal exemptions to vaccination. Most state vaccine laws do not allow unvaccinated students with vaccine exemptions to attend school during confirmed outbreaks of certain infectious diseases for defined periods of time. Remember: Nobody has the moral authority to force you or your child to be injected with a vaccine without your voluntary, informed consent and you have the legal right to exercise exemptions to vaccination according to the laws in your state. You have the legal right to know the risks and complications of vaccines BEFORE you make the choice of whether or not to allow your child to be vaccinated. The National Childhood Vaccine Injury Act, passed by Congress and signed into law by President Reagan in 1986, directed all doctors and other vaccine providers to give parents written information about vaccines BEFORE children are vaccinated. Remember: All vaccines and other pharmaceutical products carry a risk of injury or death and those risks can be greater for some than others. Never agree to use a vaccine, drug or other product without fully informing yourself about ALL risks. The product information insert, which drug companies by law must include with every vial of vaccine provided to public health clinics and private doctors’ offices, includes a description of the vaccine’s reported reactions and precautions. You can ask for a copy of that vaccine information insert from your doctor or state health department. Knowledge is power. Arm yourself with accurate information about vaccination and health. Do your own research and talk to one or more trusted health care professionals before you make any health care decision. Become an educated consumer and you will be empowered to defend your right to freely make voluntary choices about health, including vaccination, for yourself and your children. Remember: If you arm yourself with accurate information about vaccines and health, you will be prepared to intelligently and rationally discuss your vaccine choices with your family, friends, colleagues, doctors, elected officials and others in your community. When you are standing up for your right to know, and freedom to choose, whether or not to vaccinate yourself or your child, how you go about exercising your rights will determine whether or not you will succeed. In your contact with doctors, school or government health officials, remain calm but politely firm when explaining and defending the vaccine choice you have made. If you are treated with disrespect or are harassed in any way by a doctor or government official, do not engage in an unproductive argument. You may want to contact an attorney, your elected state representatives or local media if you or your child are threatened. To publicly post a report of harassment for your vaccine choice, click here. Remember: Treat others as you want to be treated, even if you are being attacked or harassed for the vaccine choice you have made. Protect yourself and your family by seeking legal or other expert counsel, if necessary. Serve as an example for others in your community whenever you defend your right to exercise voluntary, informed consent to vaccination, including the right to decline to use one or more vaccines for yourself or your child. Report serious health problems, hospitalizations injuries and deaths that occur after vaccination to the federal Vaccine Adverse Events Reporting System (VAERS). (If your doctor won’t report, you have the right to make a vaccine reaction report to VAERS). Remember: It is wise to keep written records of your interactions with doctors, school and health officials that involve vaccine choices you make, as well as copies of any vaccine exemptions you file with the state. You may have to hire an attorney to defend your informed consent rights when it comes to vaccination and it is important to have written records. It is not easy to stand up for the right to make informed, voluntary choices about vaccination when public health officials, the pharmaceutical industry and many medical doctors are putting pressure on all Americans, especially parents, to use every government recommended vaccine. The fact that the numbers of doses of government mandated vaccines have tripled in the past quarter century, while the numbers of chronically ill and disabled children have also tripled, offers an opportunity to have a long overdue public conversation about the effects of vaccination on individual and public health. Remember: Freedom of thought and exercise of free speech is protected under the U.S. Constitution. You have the right to talk privately and publicly about any concerns you have about vaccine necessity, safety and effectiveness, and to work with your elected officials to modify the vaccine laws in your state. Become an engaged, courageous citizen activist and protect your right to make vaccine choices. Medical Exemptions: All 50 states allow medical exemption to vaccination. Medical exemptions to vaccination must be written by a medical doctor (M.D.) or doctor of osteopathy (D.O.) and are usually reviewed annually by school or state health officials. Since 1986, the Centers for Disease Control (CDC) and American Academy of Pediatrics (AAP) have eliminated most officially recognized medical reasons for withholding vaccination (contraindications) so that almost no medical condition qualifies for a medical exemption to vaccination. In most states, school or state public health officials can question or even deny a medical exemption to vaccination written by a doctor if it does not strictly conform to CDC and AAP contraindication guidelines. The National Vaccine Information Center is working with citizens who want to change vaccine laws to prevent state school or health officials from questioning or denying a medical exemption to vaccination written by a doctor. Religious Exemptions: All but two states (West Virginia and Mississippi) allow religious exemption to vaccination. These exemptions are worded differently in different states and require different forms of written documentation that must be submitted to state governments supporting a sincerely held religious belief opposing vaccination. Some states require a notarized affidavit or letter from a spiritual advisor attesting to the sincerity of a person’s religious beliefs about vaccination. The religious exemption is under attack and, in some states like New York, parents are being grilled about the sincerity of their religious beliefs by state officials and denied religious exemptions to vaccination so their partially or completely unvaccinated children cannot attend public schools. The National Vaccine Information Center is working with citizens, who want to protect their rights to religious exemptions, to add or re-write the religious exemption in state vaccine laws. This exemption, like the religious exemption, is under attack by forced vaccination proponents who want to eliminate non-medical exemptions to vaccination in America. 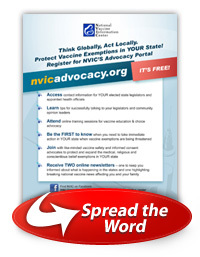 The National Vaccine Information Center is working with citizens who want to protect or add conscientious belief exemption in state vaccine laws. Vaccine Exemptions for Military Personnel: All branches of the U.S. Armed Services provide medical and religious exemptions to vaccination, but those exemptions must be first declared before enlistment in the military. If a military recruit does not clearly state a medical or religious objection to vaccination BEFORE joining the military, he or she gives up the right to object to vaccination during active military service. Failure to obey an order to vaccinate while on active military duty can result in demotion, imprisonment and involuntary discharge from the military, including dishonorable discharge. After enlistment, legal assistance is often required to successfully object to vaccination without being subjected to sanctions. Family dependents of active military personnel often must obtain approval from military officials to exempt children from vaccination for medical reasons or religious objections, especially if the children are attending military-operated daycare or schools or are deployed to foreign countries or re-entering the U.S. after living in a foreign country. Vaccine Exemptions for International Travel: Different countries have different laws requiring vaccines to enter or leave the country. Most developed countries, including those in Europe, currently do not require visitors to show proof of vaccination. However, some countries in Africa, Asia and elsewhere may require certain vaccines to enter or exit. Click here to check the CDC website on travel vaccine requirements. Other Vaccine Exemption Issues: Vaccine choices also can affect adoption, immigration, child custody arrangements during divorce proceedings, eligibility for health insurance and government entitlement programs, and medical care. Children adopted from foreign countries as well as in the U.S. may be required by US law and adoption agencies to receive certain government mandated vaccines. Immigration laws also contain vaccine requirement provisions. In cases of divorce, one parent may attempt to gain full custody of a minor child by using the vaccine choice issue as leverage. Some families have been dropped from medical insurance plans or barred from eligibility for government funded medical care and food supplement programs if children are not given all government recommended vaccines. Increasingly, pediatricians are refusing to treat children who are not fully vaccinated and, in some instances, medical personnel in hospital emergency rooms and physicians’ offices have reported parents to state child social services agencies for child medical neglect for refusing to vaccinate their children. In these circumstances, you may need to consult to protect informed consent rights. The National Childhood Vaccine Injury Act of 1986 was passed by Congress to protect vaccine manufacturers and vaccine providers from liability for vaccine injuries and deaths in civil court. If a child is injured by a government recommended or mandated vaccine, the child must sue the Secretary of Health for damages under the Act in the U.S. Court of Claims in Washington, D.C. If the vaccine injured child is turned down for federal compensation or offered too little to provide for the child’s lifetime care, a lawsuit may be filed in civil court against a vaccine manufacturer or negligent doctor with certain restrictions. By 2009, about $2 billion had been awarded to vaccine victims for brain inflammation and immune system damage leading to permanent injury or death, even though two out of three children are turned away for federal compensation. When you or your child is injured by a vaccine, the risks are 100 percent, and you will be left to deal with the consequences. Those who make and give vaccines are protected from liability in civil court, and federal vaccine injury compensation is very difficult to get. There is no guarantee that a vaccine will, in fact, protect against an infectious disease or that exposure to an infectious disease will cause a complication, injury or death. Good health is about so much more than vaccination and preventing experience with infectious disease. Vaccines are pharmaceutical products that carry a risk of injury or death that is greater for some than others. The right to informed consent to medical risk-taking is a human right. Empowering ourselves with information and taking responsible action to protect the right to exercise voluntary, informed consent to vaccination in America is one of the most important actions we can take as citizens to protect our freedom. Don’t let anyone force you or your child to take a vaccine without your voluntary, informed consent. If a doctor denies you or your child medical care because you want to make vaccine choices, find another doctor. If a doctor threatens you, or if a government official denies a medical or religious exemption that you have legally filed, find an attorney to help you. If you don’t like the vaccine laws in your state, contact your elected officials and work to change them. Together, we can educate the public and reform vaccine laws in America to protect the right to make informed, voluntary vaccination decisions for ourselves and our children. Diseases & Vaccines — A list of diseases that have vaccines, selected stories about the diseases and the vaccines, and other links to find information about them. Founding NVIC in 1982 with parents of vaccine injured children, she developed strategy for and led a national, grassroots movement and public information campaign to institute vaccine safety reforms and informed consent protections in the public health system. Her book, DPT: A Shot in the Dark, which she co-authored with Harris Cou lter, Ph.D., was the first major, well documented critique of America’s mass vaccination system calling for safety reforms and the right to informed consent to vaccination. She has served as a consumer representative for more than 15 years on vaccine advisory committees and has testified in state legislatures and in Congress, as well as represented consumers in many scientific and other forums as an advocate for vaccine safety and informed consent protections in the mass vaccination system. She is a consumer voice for vaccine safety and informed consent issues on radio, television and in print and Internet news reports on the science, regulation, policy, and ethics of vaccine policy and law. During the past three decades, she has debated more pediatricians and U.S. public health officials on the subject of vaccine risks and informed consent on television, radio and in other public forums than any other American. Effortless Healing – One Step at a Time – NOW AVAILABLE! A sneak peek of my new book! Books will be mailed starting February 24th, but you won’t need to wait until it arrives to get started. Begin reading my new book right away with your free sneak preview! That’s right. When you order a copy of my new book Effortless Healing, you’ll be making a much-deserved donation to the key organizations that work quietly and efficiently behind the scenes to make the world a healthier place for you, your family, and your community. Organic Consumers Association (OCA) – A grassroots public interest organization campaigning for health, justice, and sustainability, and addressing food safety, GMOs, the industrial agricultural complex, children’s health, and more. The ONLY U.S. organization focused exclusively on the interests that you and I share! Fluoride Action Network (FAN) – An international coalition aimed at ending water fluoridation and alerting you to fluoride’s environmental and health risks. FAN keeps you informed about fluoride toxicity, and monitors government actions that may expose you to fluoride.